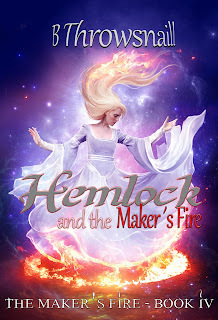 Here is the cover art for the forthcoming Hemlock and the Maker's Fire (The Maker's Fire - Book Four). It was created by the wonderfully talented artist Elena Dudina . She has done the prior three covers in the series, and I think she really outdid herself on this one! I recently got some very comprehensive feedback on the manuscript from my beta reader, and now I have some rework to do before it's ready for the editor. I will try to make this work go as quickly as possible. I'm also wrestling with the ending a bit. I love the current ending I've written, but there's one aspect of it that I now worry is inconsistent with one of the core themes of the series. I need to figure out a way to fine tune the ending. I'm hoping it won't need a total rework and that a refinement will suffice. Thanks for reading, and hopefully I will be able to report some good progress in my next blog post!